Based on Work Order Management being one of the core features of the our software, we include many powerful tools including the Work Matrix. From this tool you can sort, filter, view, and check current work order counts in a number of meaningful ways. The Work Matrix can be conveniently found as a tab on the MRO (Maintenance, Repair, and Operations) application Home Screen and provides two key sections including the summary grid and the sorting rows. The grid shows a detailed view of current work orders broken down by the following groups: All, Open Requests (aka Unscheduled WOs), and Open PMs. The sorting rows are user definable and in the screenshot below we can see the gradient blue rows grouping the work orders by Shop and then by Labor Assignments. The Work Matrix sorting can be defined using the two drop down filters at the top of the grid to choose one or two distinct sorting options. One common sorting combination is using Shop as the primary sort and Labor Assignment as the secondary. In addition, the repair center is a default sort that is not required to be selected. Several sorting options include multiple selections and can accomplish a broader view of your work orders. One example is the “Categories, Problems, and Procedures” choice that includes three groups. 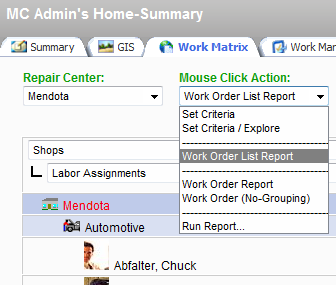 The true power of the Work Matrix can be found in the Mouse Click Action drop down pictured below. From this menu, you can select the action you want to perform when a cell is selected. 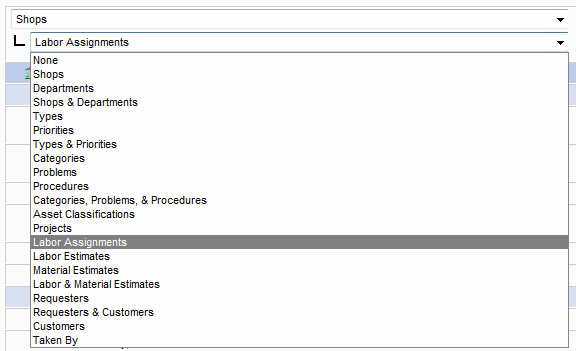 The core choices are to “Set Criteria” in the Work Order Explorer, run a basic “Work Order List Report”, print the work order hard copy via the “Work Order Report” option, and pass the selected WOs as criteria to any other pre-configured report via “Run Report …”. For example, if I click on the 3 displayed in the screenshot below, the Work Matrix will send the filter information to the standard Work Order Report to print those 3 specific work orders in batch. As we have demonstrated, the Work Matrix is a powerful analysis tool that can be utilized to manage your open work orders. If you haven’t used it already, give it a try, and if you have any questions be sure to let us know as we are always glad to help. You can reach our support team at (888) 567-3434 x82 and/or support@maintenanceconnection.com during regular business hours.